Longtime Lamesa, TX resident and former Goodland, KS resident Luisa V. Medrano passed away on Thursday, April 4, 2019 at the Good Samaritan Society-Sherman County in Goodland, KS. Luisa was born on September 18, 1932 in Lyford, TX to Cayetano and Maria (Galvan) Vela. She was one of two children. She attended school through the 3rd grade, and later went on to obtain her GED and became a CNA. She married Francisco Medrano II in Texas in 1950. Religion was very important to Luisa, and to show her love for her Lord, she had memberships at various Church’s in Texas, helping out and doing whatever was needed around the church. The second most important thing in her life was her family. She enjoyed spending time with all her brother, her children, and grandchildren. She also had a love for animals. Preceding her in death were her parents, one daughter Janie Sauseda, two sons, and her brother Lalo Vela. 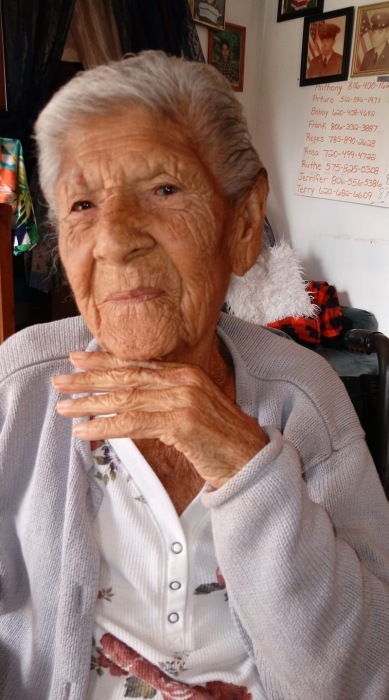 She is survived by her children Maria Medrano of Goodland, KS, Ruth (Rito) Villa of Portales, NM, Art Medrano of Austin, TX, Ramiro Medrano of Lubbock, TX, Estella Rascon of Lamesa, TX, Frank Medrano of Lamesa, TX, Cayetano Medrano of Amarillo, TX, Rosa Vasquez of Aurora, CO, Bobby Medrano, of Lamesa, TX and Anthony Medrano of Amarillo, TX. She is also survived by 37 grandchildren, and numerous grandchildren and great grandchildren.